French people don't pack. At least that's what my friends learned when Candy fell in love with a paper mache horse during a recent trip to Saint-Ouen Flea Market. Starting with an asking price of 380 euros, merchant Mme de la Vallee bid an emotional adieu to the former mascot of an equestrian center and wished it bon voyage for 250 euros. What a deal! Surprised by their unwieldy acquisition and wondering if Candy and Bob were planning to ride the horse back to Ohio, Candy assured me that she had recently used UPS to send purchases from the tiny little town of Oaxaca, Mexico without any hitches. Therefore, it shouldn't be a problem to ship something from an international city like Paris, right? As Candy's a resourceful woman well-versed in the ways of the world, I had no qualms directing her to the nearest UPS affiliate, Office Depot. Cheerful as always, she waved goodbye and started down the five flights of stairs with the cumbersome horse tucked under her arm. If you're wondering why she didn't take the elevator, imagine squeezing a large paper mache mascot into a space the size of a miniature closet. Without amputation, it's impossible. Moments later, Candy returned huffing and puffing with the animal. In between trying to catch her breath and answer our questions, she replied that the UPS agents had adamantly refused to pack the horse. Frustrated by the lack of customer service, I called UPS and explained what had happened. After measuring the height, width and breadth of the horse and thinking of the right words to accurately describe it in French, the agent assured us that the Office Depot located on Avenue de Versailles would take care of everything. No problem! Feeling as apprehensive as a mother sending her child off for the first day of school in a strange land, I waved goodbye to Candy and wished her luck. I really shouldn't have worried though because it wasn't long before she reappeared with...you guessed it...the horse! It turns out that UPS will only ship something after it has been packed. They will not wrap it and box it for you. Neither will Fed Ex. But do you think that the UPS agent could have told Candy before she was forced to hold the horse high above her head to make room for the cheek-to-cheek crowds on the bus during rush hour? No way! The good news is that Candy discovered the key to making Parisians smile. Paper mache horse, anyone? The last time I saw the animal it was being stuffed, rather indecorously, into the trunk of the taxi bearing Candy and Bob to the Gare du Nord for their trip to London. For some reason, they decided against taking the metro. Bob, a talented artist, did the above sketch as a memento for Stephane and me. 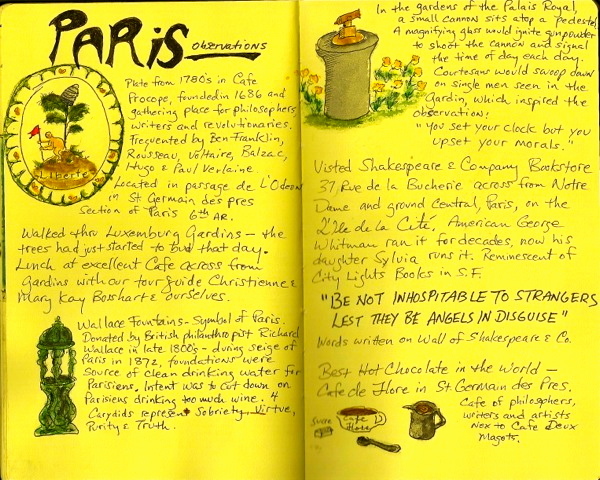 Take a peek inside Bob's travel journal to see what else we did while they were in Paris. It may inspire you to start a journal of your own! In spite of my recent post about not hanging curtains, I promise that they were some during Candy and Bob's stay! Bob's rendition of the view from our balcony! LOL! So funny! It reminds me of the time I bought a toy Gun with mr grandson at eurodiisney. B efore realising Iwe would not be able to take it on a plane. To placate my heartbroken grandson I promised to send it by post. Not realiseing. That in itself would present problems. AS you can imagined. Plus stretch my very limited French. I also learned about French beurocracy !!! You're such a wonderful grandmother, Denise! I hope your grandson has a little bit of an idea of what you went through to get his gun home. I love the art! What a great way to remember a trip, even better than photographs in some ways: it causes you to take a moment, to actually see what is it front of you. And who cares how accurate it is. Love the art. And I see he prefers the hot chocolate at Cafe de Flore too. And the story, oh my. I once carried an metal chandelier home from Germany--that was when airlines were actually accommodating. Today, forget about it. Bob's travel journals are fantastic. Following his lead, Stephane and I tried to do the same thing during a trip to Italy but were unsuccessful. Bob was often sketching something while we were exploring Paris and after telling him about the artist who paints portraits on metro tickets, Bob started doing the same thing. Amazing! 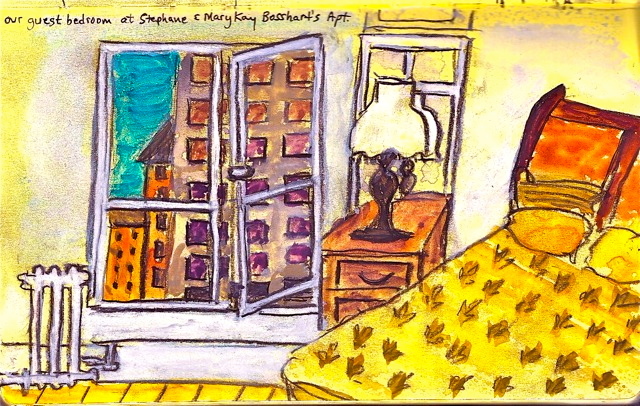 As for accuracy, I prefer that Bob omitted the curtains in the guest room so that we can see the view. I had to laugh, however, since we had just discussed the "hanging of the curtains" dilemma in an earlier post. Bob and Candy raved about the hot chocolate at Cafe de Flore. One of these days I may have to forego my regular champagne and try one. When I was with them, I had a coffee. Ahh, I long for the good old days when we could carry metal chandeliers on planes! I would have loved to have seen the faces of the flight attendants and other passengers if Candy and Bob had tried that with their horse! Ooh, very chic, very impressed! I think it was UPS I used to ship a suitcase up to Tours when I moved to Nice - I went in first and specifically asked if they would ship a suitcase, since I only had my work address and thought that would make transporting it to my new home (when I found one) easier. Yep, no problem. So I went and bought a cheap suitcase - it broke with just my shopping in on the way home. Returned it, the guy took it back but warned me that was the last time he'd exchange it. Packed it full of stuff and hauled it to the UPS office, it broke on the way there, as expected, but then they made me purchase a UPS shipping box to put this bloody suitcase in as they would NOT ship a suitcase as is. So instead of getting a free box from the supermarket or whatever, I paid something like 35 euro for a broken suitcase and a cardboard box I didn't want in the first place, plus shipping. Jesus wept! No worries, Gwan! I didn't think that you were trying to ship a half open suitcase with your clothes falling out of it via UPS. But how annoying! Their customer service leaves much to be desired. Why couldn't they just tell you that you would have to put the suitcase in a box when you went to the trouble of checking with them first. The lack of clarity is what bothers me. As I frequently tell Stephane, it's a vicious circle because you have to know the right questions to ask to get the right answer...but if you don't have enough information to ask the right question, you end up spending 35 euros on a broken suitcase and a box! What wonderful illustrations! This story is too funny and of course i completely believe that this happened... oh the French! What ended up happening to the horse? Did they mail it in England? I'm so the person that would buy something like that and make Sir L carry it around the entire trip... On a side note, where is a good place to buy curtains that does not require a trip to Ikea? i still haven't gotten around to that.. and clearly it's a must! Postscript: After being continually told "Non, non, non" in Paris, Candy and I hand-carried our horse onto Eurostar and found the nearest UPS location in London where two friendly, accommodating young blokes told us: "Absolutely no worries - we can pack and ship this to Ohio immediately. We pride ourselves on fulfilling all our customer requests!" Of course, it cost us over 200 pounds to ship -- about the cost of our original purchase. Oh well, it's only money. And now Mary Kay has immortalized our cheval de papier de mache. Not to end on a negative note, 98% of the Parisians we encountered were smiling, friendly and accommodating...in the most beautiful city in the world. Kristen, I haven't bought any curtains here because I'm using the sheers from our apartment in Switzerland. In the past, I've purchased curtains from Heytens. They have two stores in Paris. And I've been meaning to check out Madura. Their window displays always catch my eye but I haven't been inside yet. While I'm sure that there are lots of places where you can find curtains in Paris, the only ones that I know of are Heytens and Madura. I included links for their websites in the comment above. Oh, can you really see the Eiffel Tower from your appartement? How wonderful! I love Bob's drawings, they're smashing. Unfortunately, we can't see it from our apartment but we can if we step outside on our tiny balcony. It was great to have Bob as our "artist in residence"! Btw...I like how the horse was being "stuffed" in the trunk of the taxi. "but hey, you've got a good story out of it" - spoken like a true blogger! 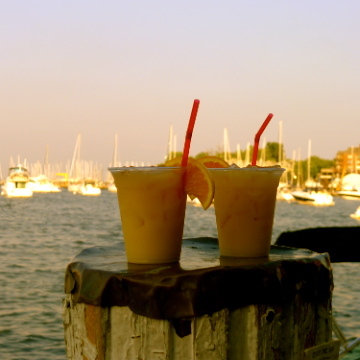 Isn't it funny how your perception of things changes when you start blogging? I can't imagine having to ship things from France on a regular basis! And "mail training". Seriously?! What's even more funny about the horse being stuffed in the trunk is that he has a little smile on his face, almost as if he appreciated the comedic aspects of the situation. I'm smitten with the drawings too. That's high compliments coming from you! I'll have to tell Bob to take a look at your work. It's fabulous! I just looked up Carol Gillot's work and I'm very impressed. Carol, you're the real deal. Wonderful illustrations. I'm honored to get such a compliment from you. Thanks.